With all the craziness of the end of year I haven’t had a chance to post for a while, so I’m catching up now that I have a little time available. I took a trip to Lae a little while back. 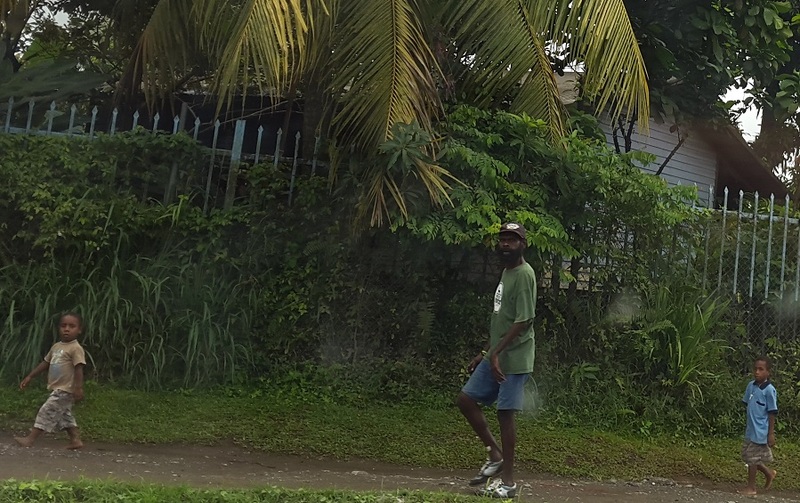 Lae is the second biggest city in Papua New Guinea, with a population of a little over 100,000. 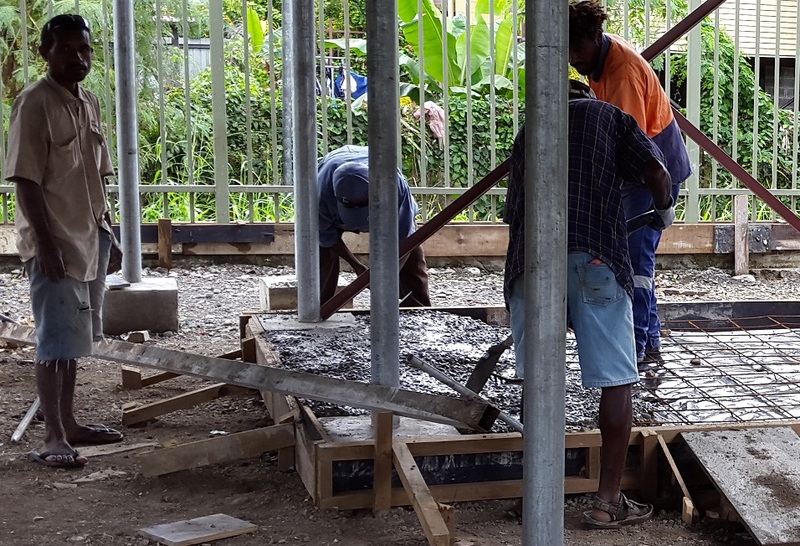 It is also the second major economic centre in the country, after Port Moresby. 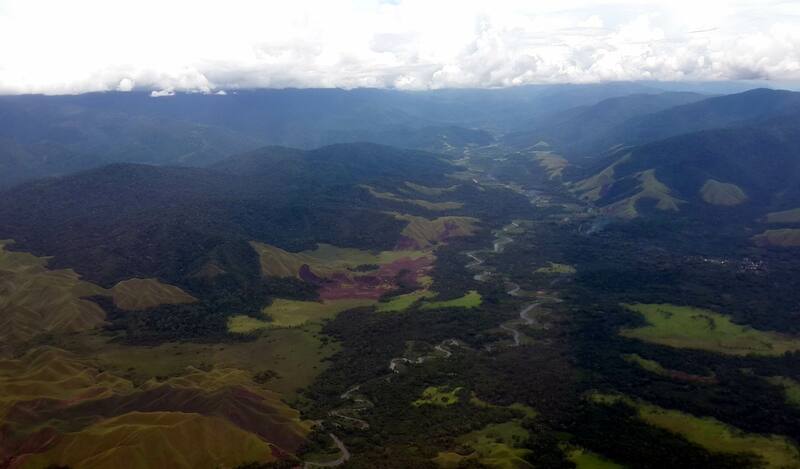 Crossing PNG always gives one a view of some spectacular scenery. 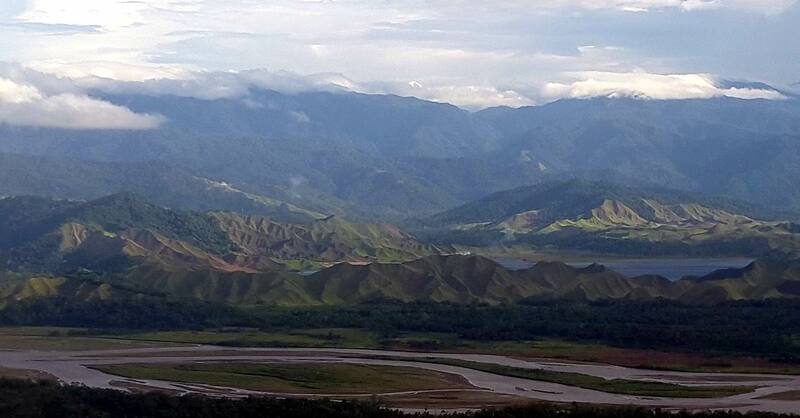 Lae is on the coast but is surrounded by a series of mountains and their foothills. 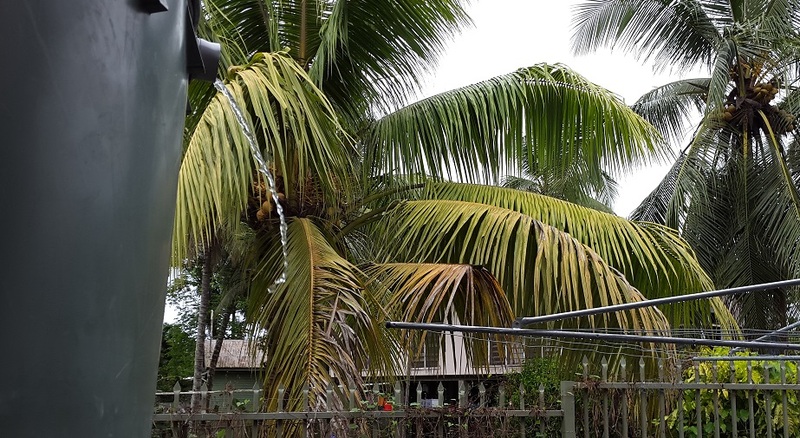 The landscape around the airport in Lae is particularly attractive. The airport itself is less so. Oh and watch out for the jet blast. The airport is an hour’s drive from the city. So one has to take a “Luxury Coach Service” into town. I think their definition of “luxury” may differ slightly from mine. The mesh is a security measure. It prevents people from throwing rocks and smashing windows then trying to grab valuables. The driver is given a special little gap in the mesh through which to see. 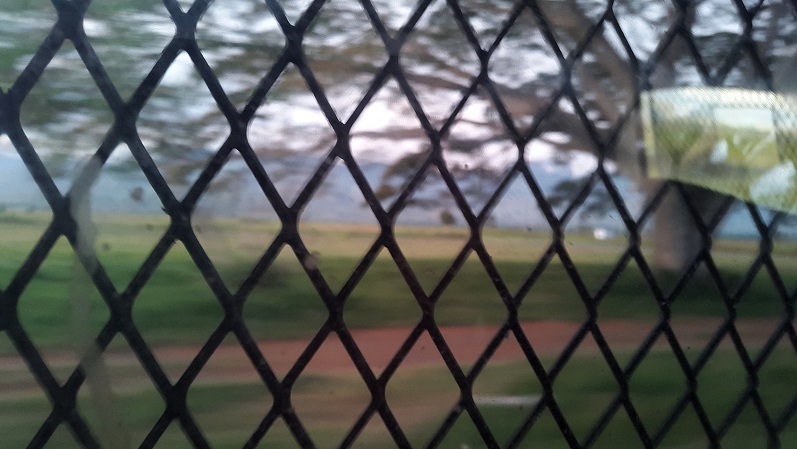 Peering out through the grill, I bounced along the bumpy roads and took in the passing scenery. 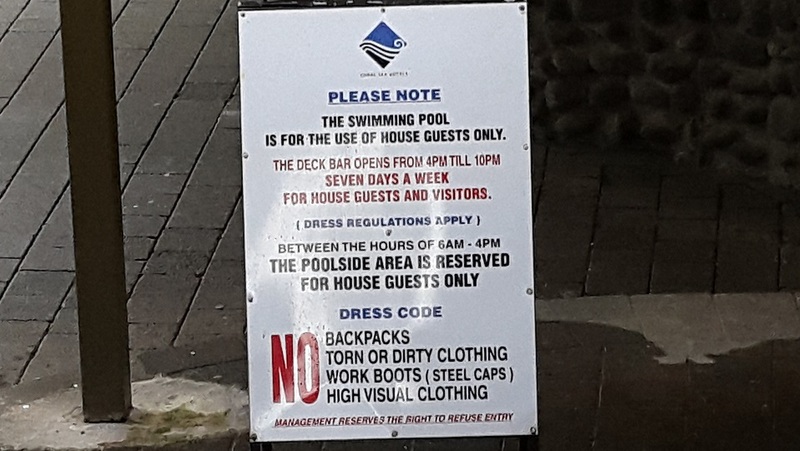 I arrived at the hotel and saw this rather odd sign telling people that they can’t come into the pool and bar area in “high visibility clothing” lest all that fluorescent orange offend anybody. 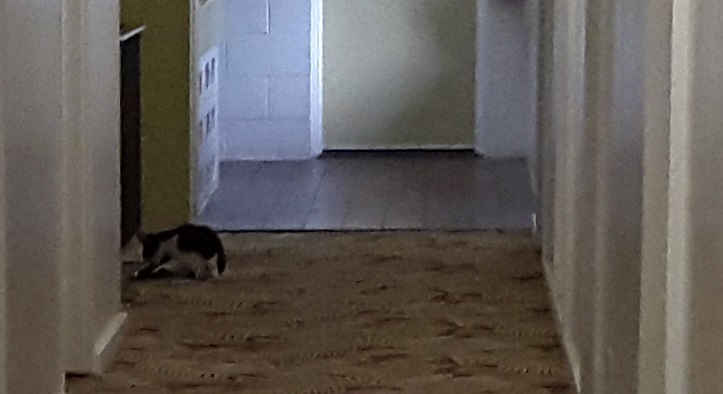 Cats, however, are allowed to roam the hotel freely. 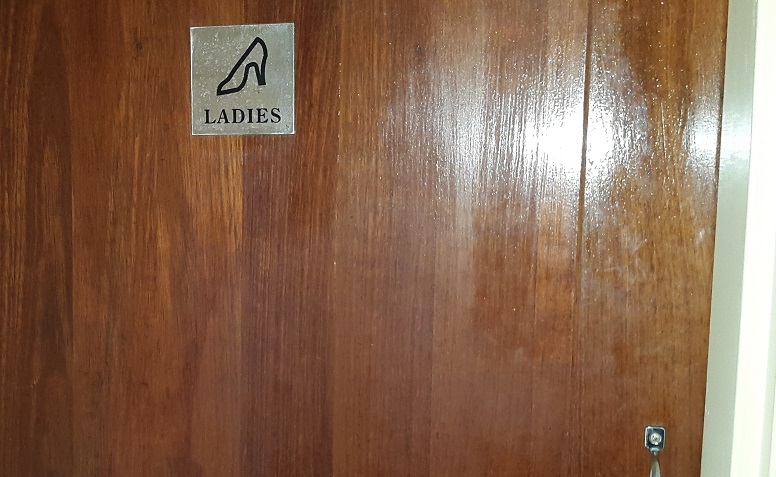 Continuing on the theme of interesting bathroom door labels – the hotel offered these options – pipes for men and high heels for women. 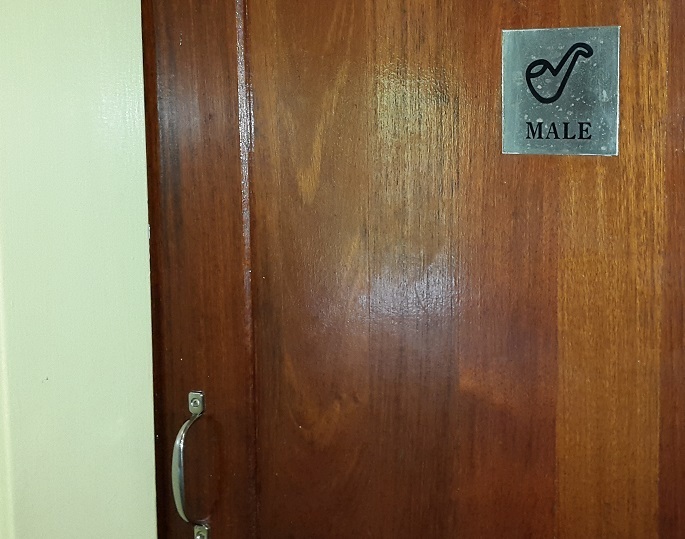 I’ve never felt so oppressed by bathroom doors before. This isn’t “Mad Men”. What if the women want to smoke pipes and the guys want to wear high heels? Did they ever consider that? 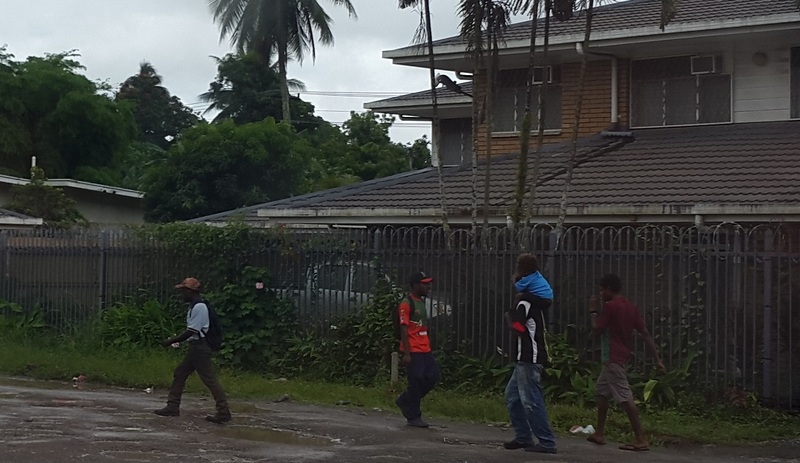 There is presently no road linking Lae to Port Moresby, and all efforts to build one have been opposed by people along the route. They either want more money for the right to build the road or they want to keep people from other parts of the country out of their territory. 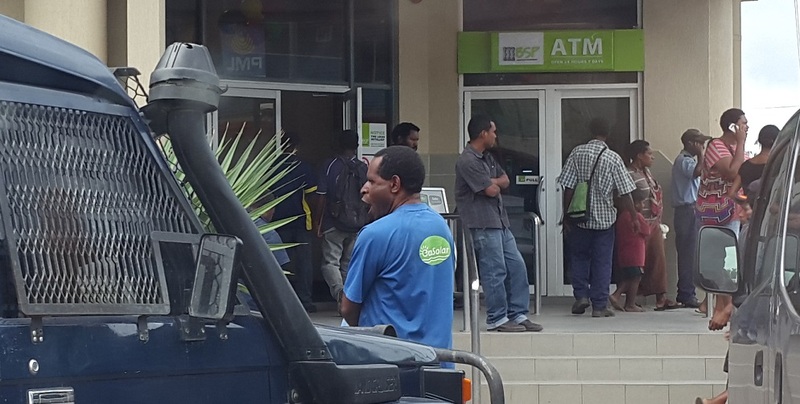 It is a major impediment to economic growth that will need to be fixed in the coming years if PNG is to move forward. 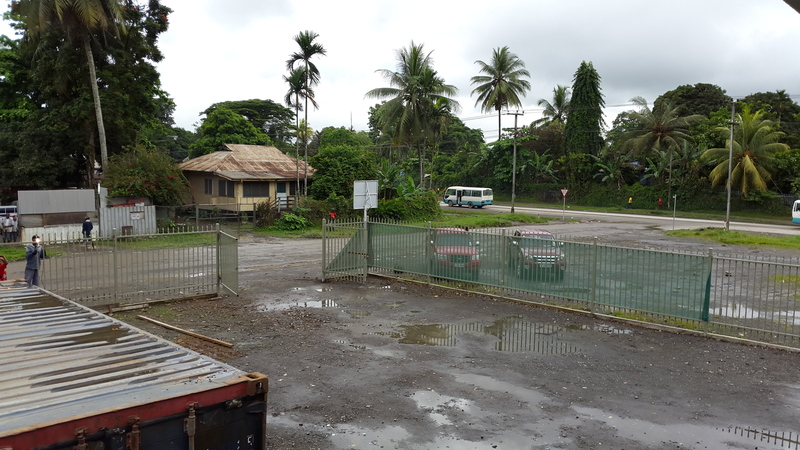 In the meantime, Lae has a huge port for shipping goods around the country. 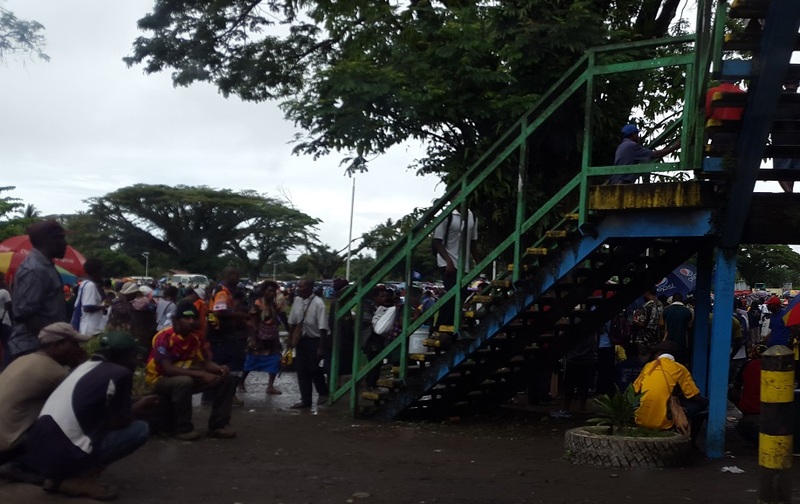 Lae is a bustling city with a vibrant marketplace. Everybody seems to be going somewhere. Lae is notorious for being dangerous and a hive of criminal activity. The reputation of the city seems to be even worse than that of Port Moresby. 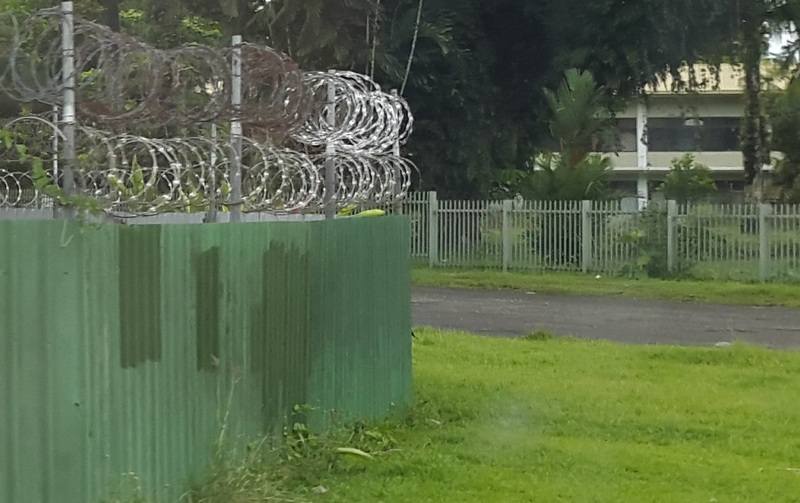 As a result, every house is surrounded by high walls with lots of razor wire. 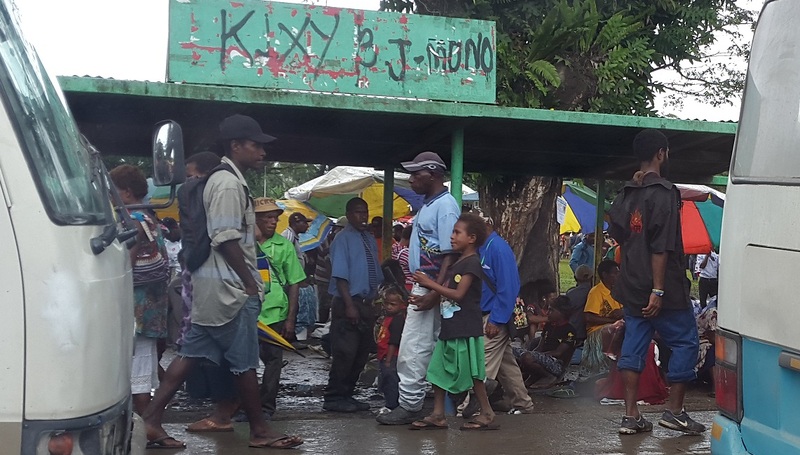 Papua New Guinean kids are so cute. They grow up amidst the crime and danger and so they never know that life doesn’t have to be that way. They always seem so happy, despite the hardships. 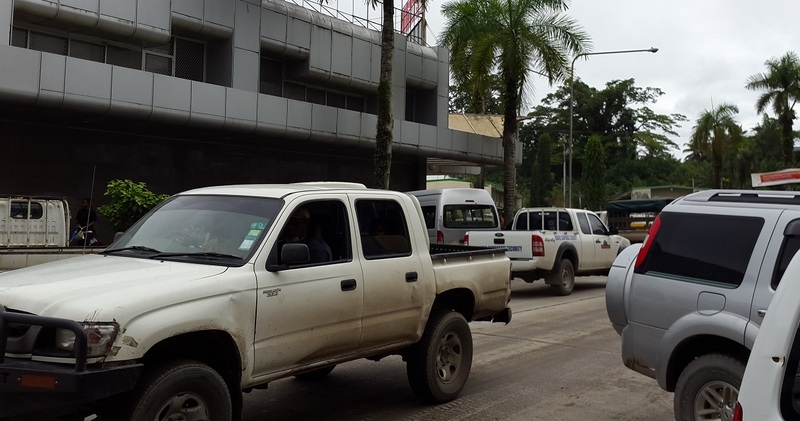 Much like elsewhere in PNG, almost everyone drives a four-wheel drive vehicle. This is largely due to the condition of the roads, however it is also partly for security. It helps to have a big 4WD so that the carjackers just bounce right off the bull-bar. 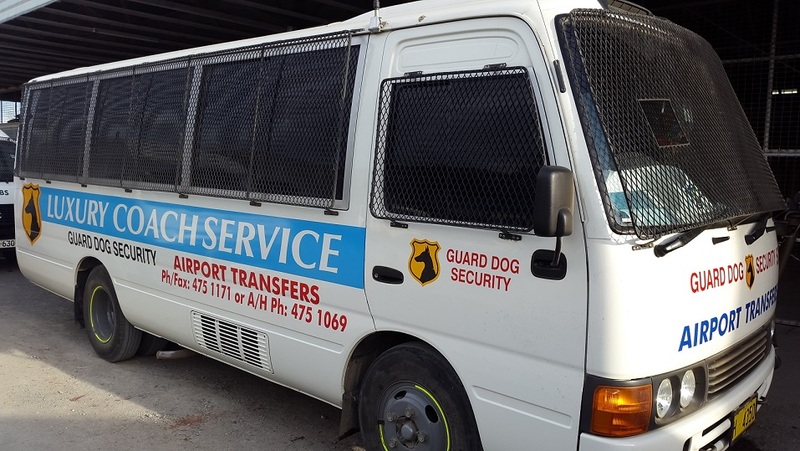 Some everyday vehicles go for the full security mesh option as well. 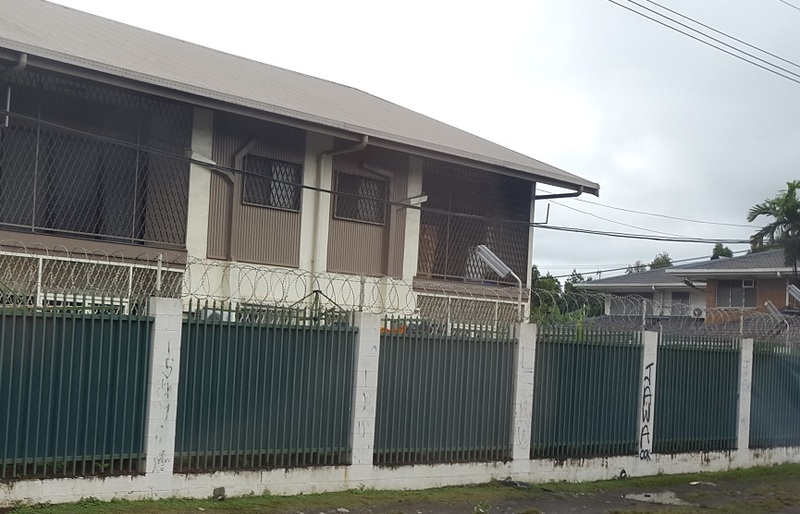 Each compound has a large fence around it that goes up at the same time as the house. 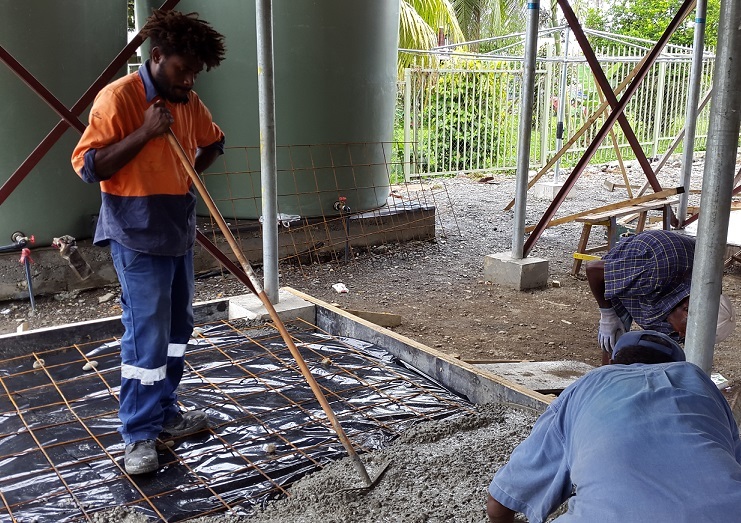 I found it interesting to watch these construction workers laying out a concrete slab. There’s no way that this chap would be allowed into the hotel bar wearing that offensive high-visability clothing. 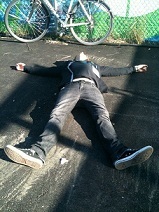 While I was watching the work, an earthquake struck. It wasn’t huge but it persisted for about a minute. In that time, the water in this tank began to rock back and forth and bursts of water started spurting out of the overflow pipe. I caught up with a friend while I was in Lae and he took me out for a meal at the glamorous Lae Yacht Club. It’s really more of an outdoor beer hall, but with a touch of class as they made me take my hat off to go inside. 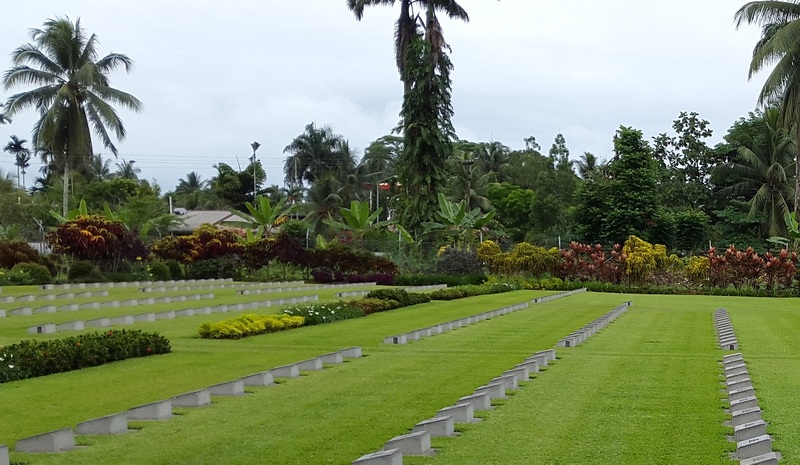 The highlight of my trip to Lae was a visit to the War Cemetery. 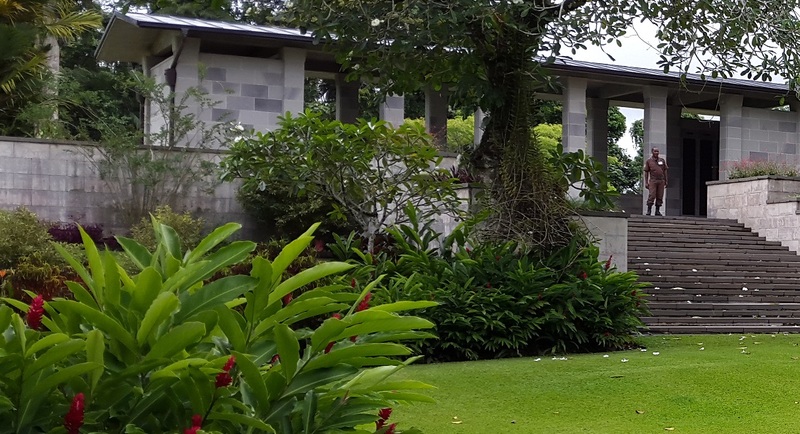 The cemetery commemorates the unfortunate souls who gave their lives fighting the Japanese in World War II. 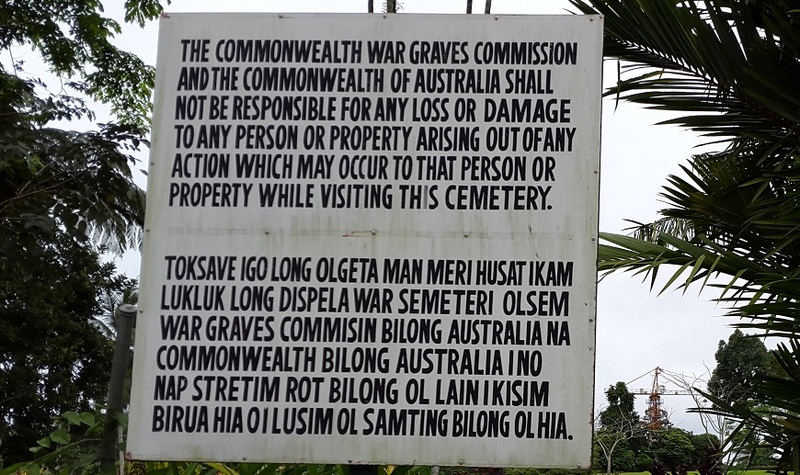 The graves are primarily of Australians, and the whole facility is funded by the Australian government. 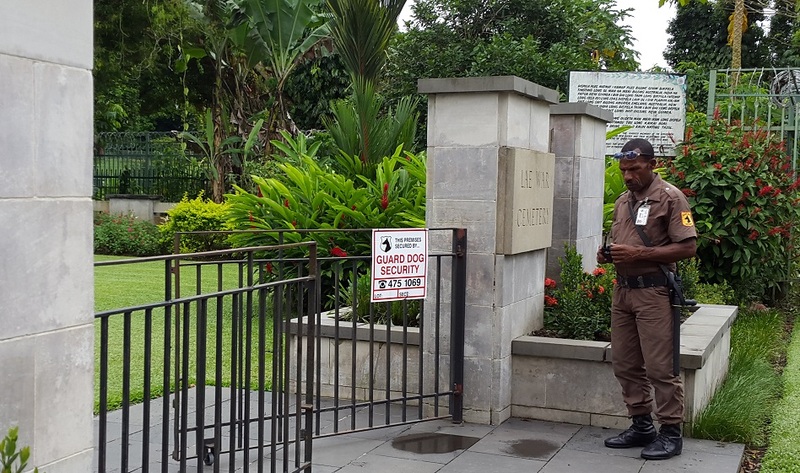 The Commonwealth War Graves Commission funds the security, which is necessary to keep the place safe from hooligans. 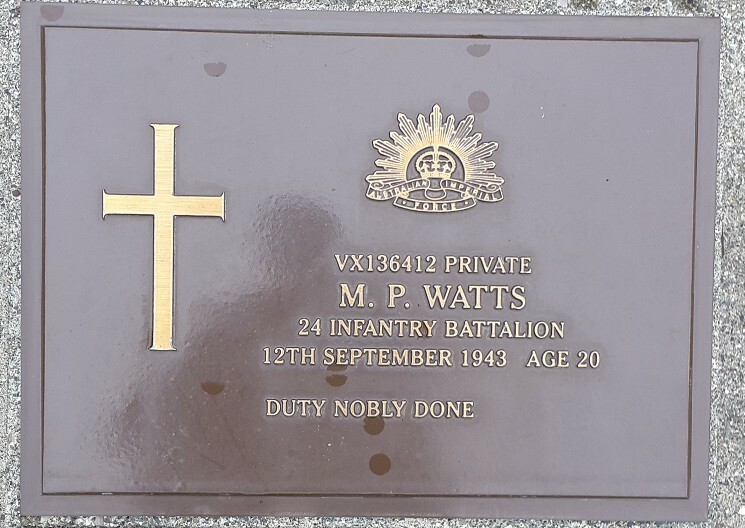 This stone structure houses a series of plaques with the names of the Australian war dead. The guard explained to me that people regularly visit this cemetery to locate the graves of long lost relatives. 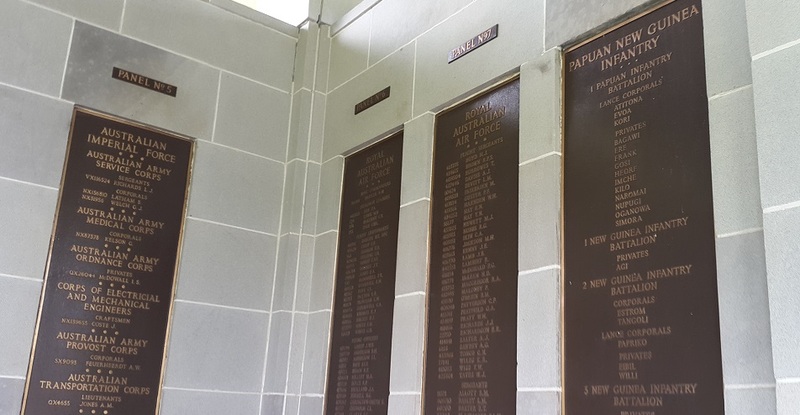 The panels list the names of those people who lost their lives defending their country from invasion. Inside the well-kept grounds, row upon row of graves are laid out. The rows of graves show the names, dates of death and ages of the soldiers. Many were only 19 or 20 years old. 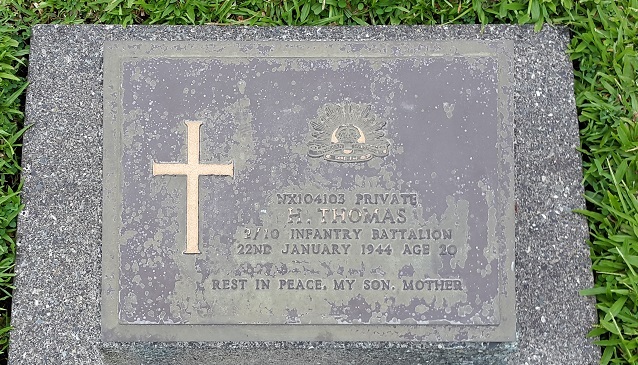 I found this one particularly moving – the chap died aged 20 and the caption reads “Rest in Peace, my son. Mother”. 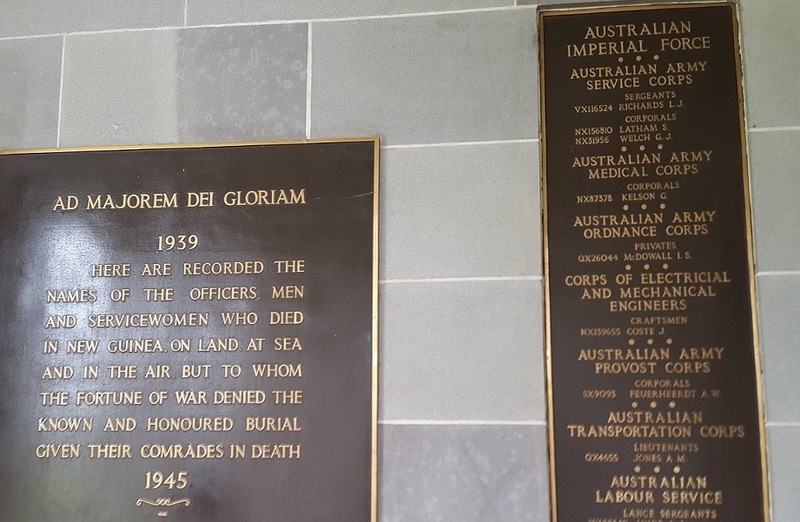 There is section devoted to the solders of the Indian army who died in PNG during the war. Sadly, none of the dead are named. 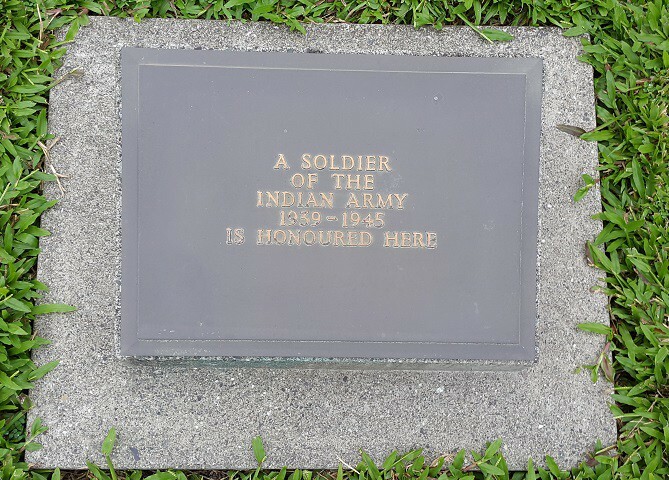 Plaque after plaque reads “A soldier of the Indian Army”. 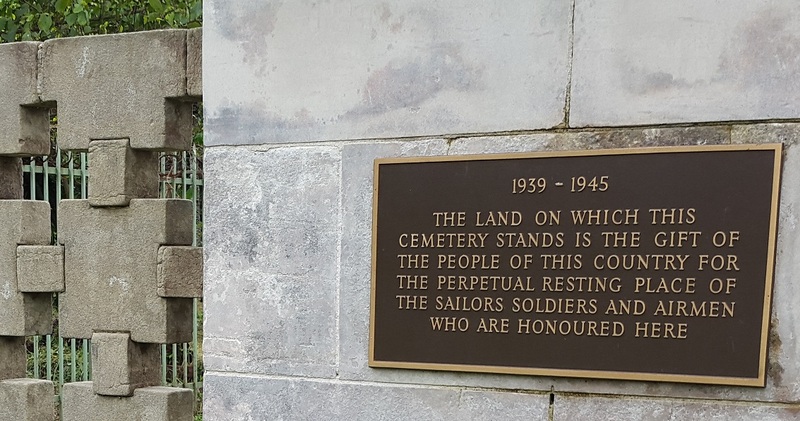 I felt troubled at the thought that the hundreds of young men buried here died fighting so far from home in a war that was more a clash of empires than one in which they had a personal gripe, and no one visiting this site will ever know their names. 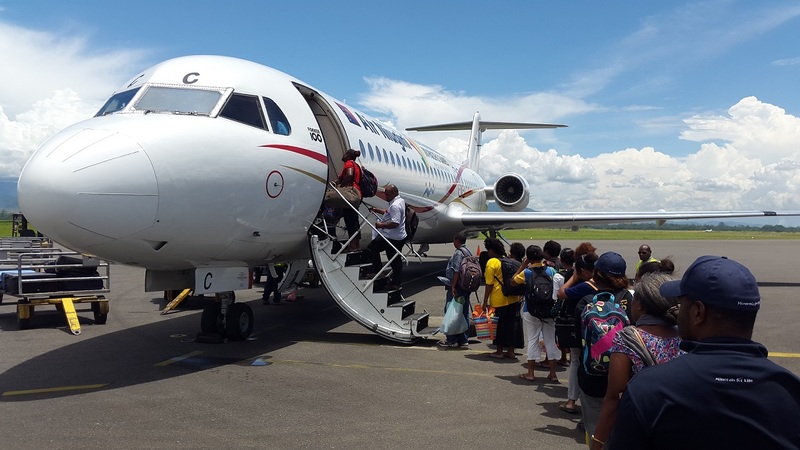 After an interesting trip to Lae, it was time to return to the airport and head back to Port Moresby. 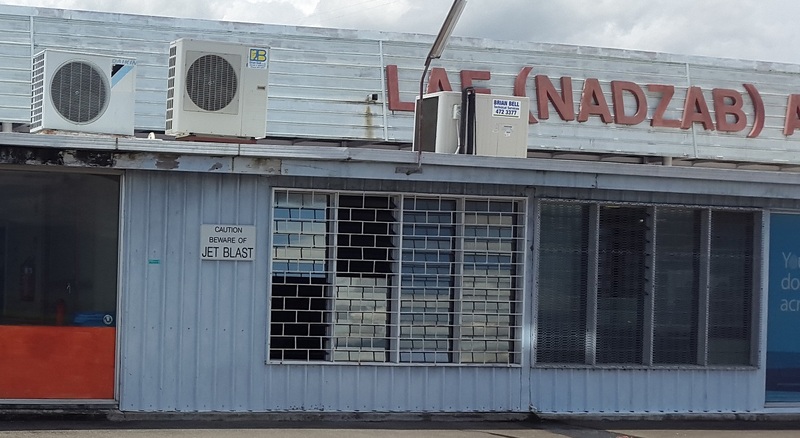 At the Lae airport, there are no shops overrun with unnecessary luxury goods. 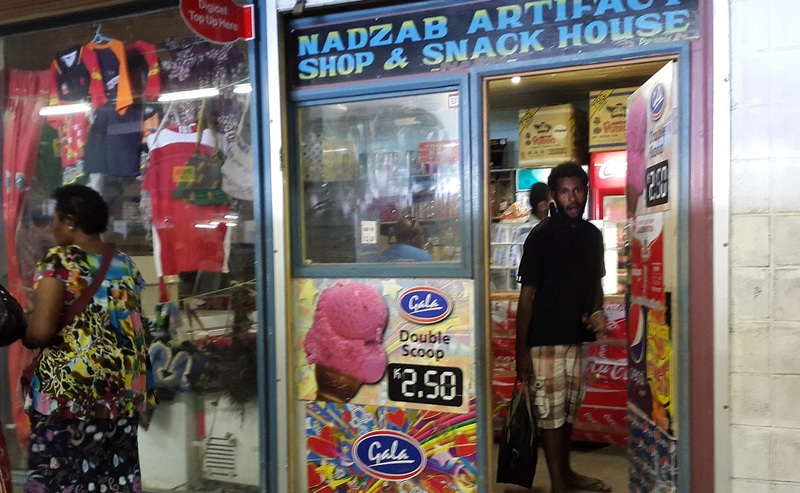 There is one shop. This shop. 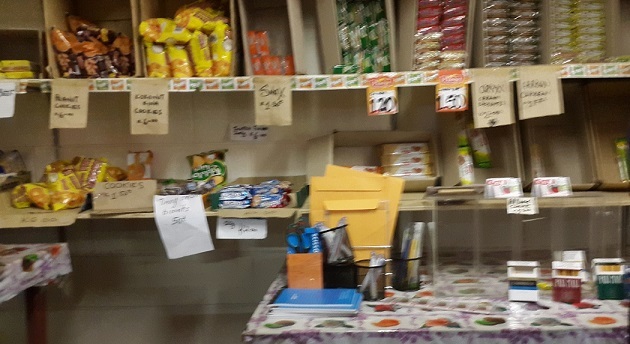 This shop sells biscuits and pies. Oh and cigarettes. I don’t eat biscuits, pies or smoke cigarettes. However, I was so hungry after the bumpy 1 hour ride to the airport that I was desperate. I pushed aside my principles and procured a meat pie. It is such poor quality food that I felt awful after I ate it. However, I can’t deny it was a tasty pie. It really was. Even without tomato sauce. The flight took us out over more amazing countryside. The mountains are simply incredible. 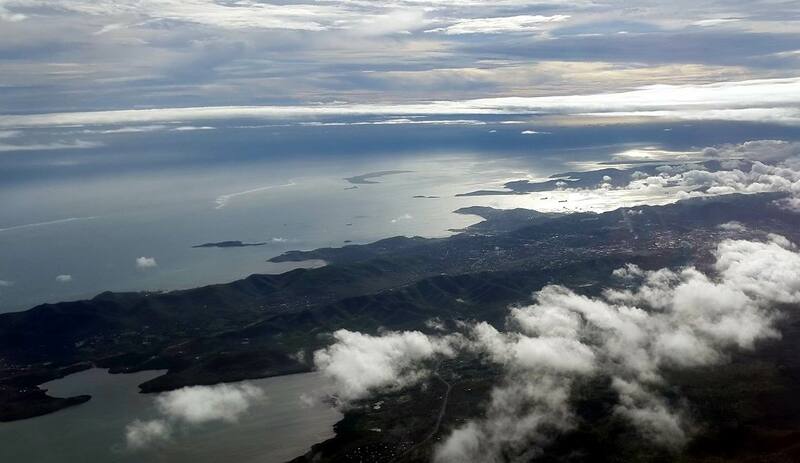 We had a great view of Port Moresby on the flight back. Apart from the horrific violence and the constant threat of disease, this really is a wonderful place. 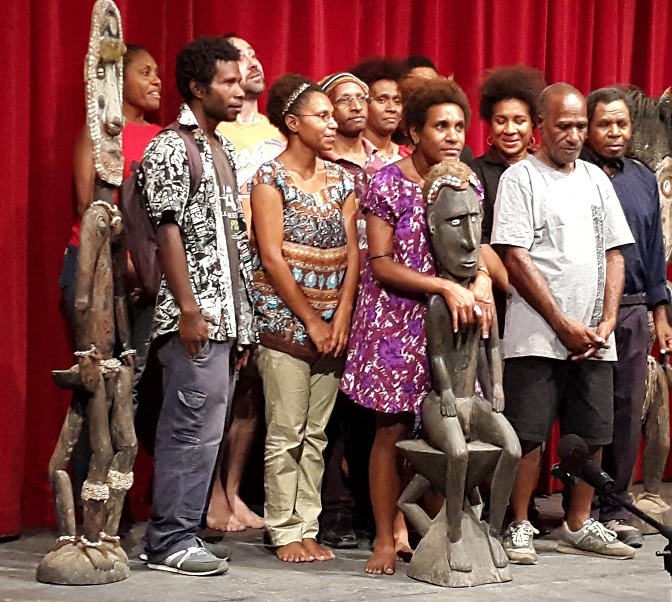 Port Moresby has a strong and vibrant underground arts community that frequently surprises. 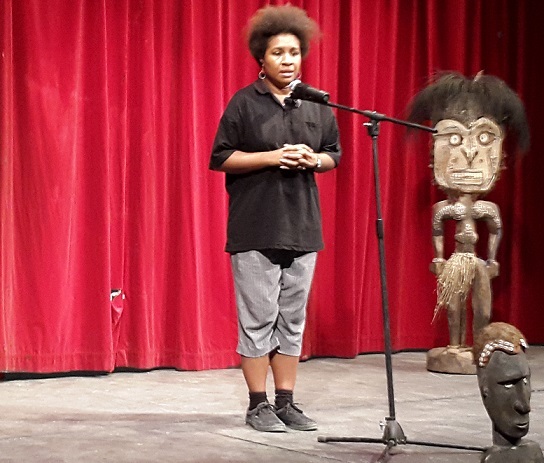 I was somewhat sceptical about attending a “Poetry Slam” recently, but I enjoyed it far more than I was expecting. The participants had written some very engaging poems and delivered them with such passion and emotion that it was difficult not to be impressed. At the end of the session the poets got together for a group photo. 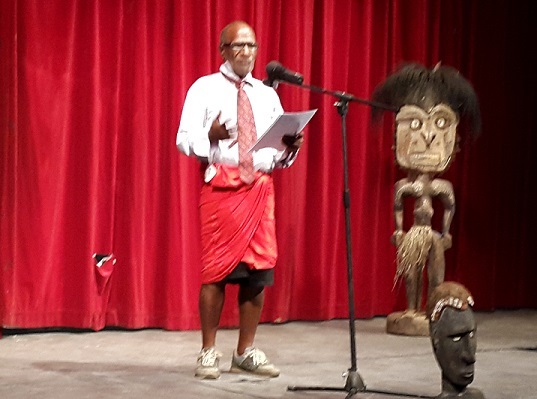 The Poetry Slam was yet another event that I would never have thought I would attend in Papua New Guinea, but which turned out to be fascinating. The winner was the fellow in the front left wearing the backpack. He wore the backpack while he was delivering his poem too. Who knows why. 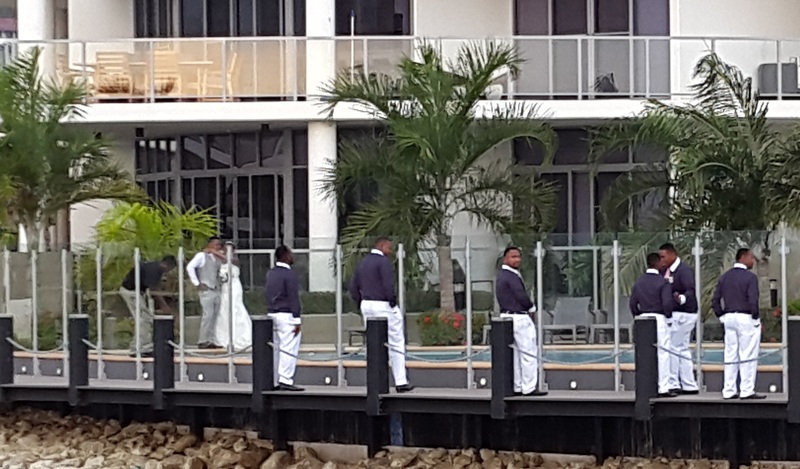 I came across this wedding party having photos taken by the seashore the other day. Much like I observed in Afghanistan and Nigeria, in developing countries people seem to find vast sums of money to put on lavish weddings. I counted eight bridesmaids and eight groomsmen. 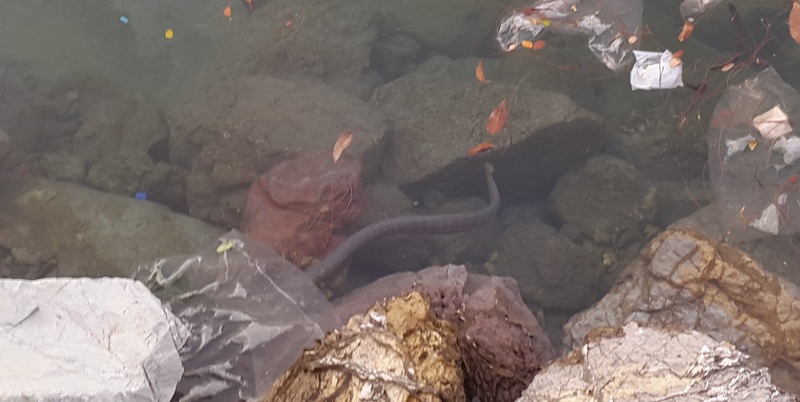 I also spotted this freaky looking eel thing swimming amongst the garbage. I have it on good authority that this yacht was formerly owned by Nicole Kidman. It is called the “Hokulani”, which is Nicole Kidman’s Hawaiian name, given to her by her parents. I’m sure we could all use our own Hawaiian name. 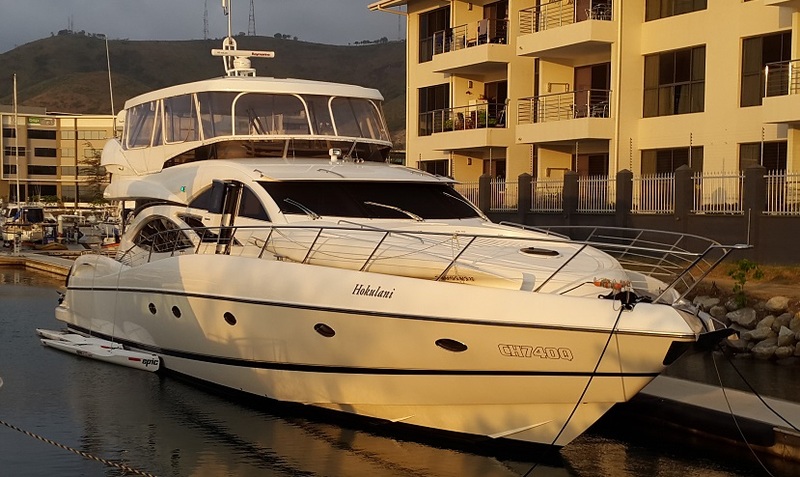 It would certainly come in handy when it’s time to find a name for our luxury yachts. ← PEACE ARK OR GEOPOLITICS?